Xiaomi has already started to feed the rumor mill with the latest details about its upcoming flagship device, the Mi 9. Unlike some other popular upcoming devices, like the Galaxy S10, we now have official info about the Mi 9. The Chinese manufacturer recently teased its fans by posting an image on Twitter that resembles the Xiaomi Mi 9’s camera concept. Although we still don’t have the official specs of the camera, you can tell from the picture that the phone will feature three vertically-aligned lenses on the back. The top snapper will likely be a depth sensor, and will have a colorful accent around it (also confirmed by GSMArena). The second lens will be the main camera sensor, while the third lens is reserved for a wide-angle camera. 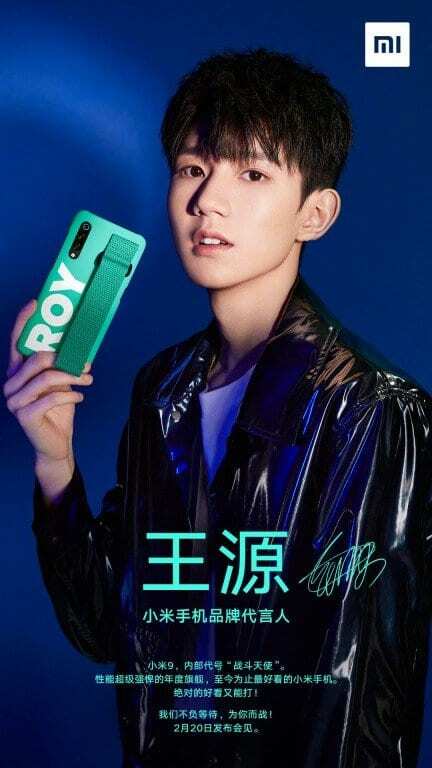 This is not the first teaser of the Xiaomi Mi 9’s rear, as the company Weibo account posted a photo with Roy Wang from TFBoys holding the Mi 9 a few days ago. The poster gives us even more insight into the Mi 9 design, as it shows the phone will also feature an LED flash, positioned underneath the cameras. As for the other specs, it’s expected the flagship will sport the latest Snapdragon 855 processor with the X24 modem. RAM/Storage options should start 6GB/128GB. The Mi 9 will allegedly be priced at $436/€383. Xiaomi will officially unveil the phone on February 20.